Al Shabaab’s attack on Dusit Hotel on January 17 resulted in 17 reported fatalities and has called into question the narrative of the group’s degradation and decline (The Conversation, 2 October 2018). An assessment of Al Shabaab’s activity and international efforts against the rebel group reveal that, while violent events involving the group have been on the decline, Al Shabaab retains the capacity to engage in lethal attacks in both Somalia and Kenya. The Dusit attack is particularly concerning as it has come at a time when the African Union Mission in Somalia (AMISOM) is drawing down its activities in Somalia. The mission was renewed in July 2018, but by late February 2019, its troops will decrease to approximately 20,000 (UN Security Council, 30 July 2018). American military activity in Kenya and Somalia against the militants has acted as an imperfect substitute for AMISOM in recent months and is insufficient to eradicate the group’s activities entirely. The attack at Dusit Hotel suggests that after the withdrawal of AMISOM, planned for December 2021, a degraded but resilient al Shabaab will engage in fewer but more destructive attacks. American military activity in the region, largely comprised of remote violence, will be of limited use in preventing such events. 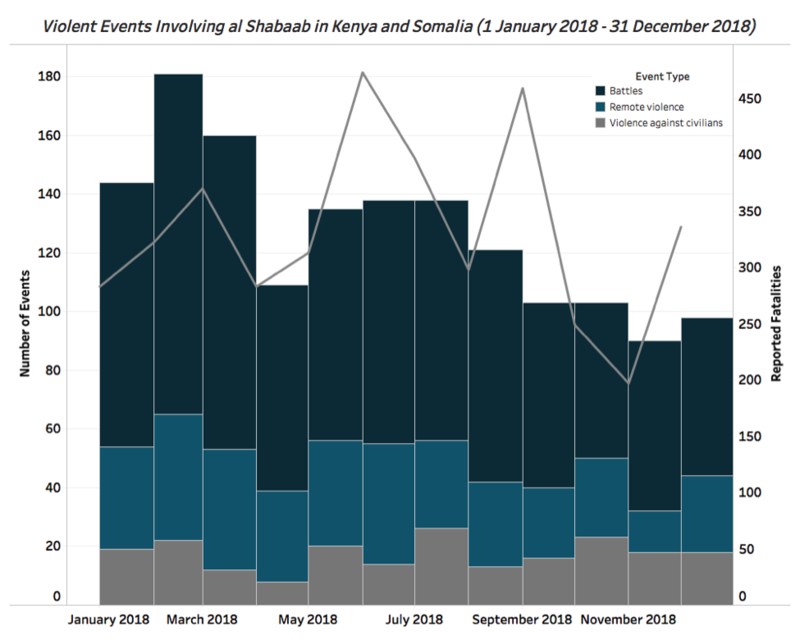 The number of violent events involving al Shabaab has been on the decline in both Kenya and Somalia throughout 2018 and into 2019 (see graph below). The overall decline is primarily in the number of engagements with government forces and external actors like AMISOM and the US military; the number of battle events al Shabaab was involved in dropped from 90 in January 2018 to 54 in December 2018. Persistent levels of events are shown in violence against civilians events, with a number of these occurring in the process of collecting taxes. This reduction in the group’s activities has been attributed to a number of factors, including these financial constraints and successful counter-terrorism initiatives (Voice of America, 24 January 2018). However, this decline in activity is not evenly correlated to a decline in reported fatalities associated with the group. This suggests a shift towards fewer, but more consequential, attacks. The average number of reported fatalities resulting from a violent event involving al Shabaab rose from 1.9 in January 2018 to 4.3 in January 2019. Furthermore, given al Shabaab’s demonstrated capacity to regroup following setbacks, and adaptation to shifting circumstances, a decline in the group’s violent events should not be confused with its defeat (Voice of America, 3 December 2014). Throughout 2018 and into 2019 thus far, 97% of violent events and nearly 97% of reported fatalities involving al Shabaab have taken place in Somalia. In 2018 there were 1475 events involving al Shabaab in Somalia and 45 in Kenya; in 2019 thus far, the rebel group’s activity remains primarily in Somalia, where there have been 54 violent events involving the group, as compared to one event in Kenya. The attack at Dusit Hotel is the latest in a series of attacks by al Shabaab on high-profile, soft targets, such as the attack on Garissa University campus in 2015. The Dusit Hotel attack was also laden with symbolism. Not only did it echo the siege of Westgate, a mall popular among Western expatriates and well-to-do Kenyans, in 2013; the attack on Dusit Hotel also fell on the 3rd anniversary of a major attack on the Kenyan contingent of AMISOM. Many analysts have suggested that this date was chosen specifically for that reason (The East African, 17 January 2019 and Robyn Lee Kriel). In claiming the attack, al Shabaab internationalized the event, denouncing international developments and Western countries’ activities in official statements about the event (Long War Journal, 16 January 2019). Though this attack was unusual, it may be a sign of what is to come as the al Qaeda-linked faction of al Shabaab asserts itself vis a vis its rebel competitors in the country (Long War Journal, 16 November 2018) and as AMISOM begins to draw down its mission in Somalia. AMISOM was initiated in 2007 and was granted an initial six-month mandate. In the twelve years since establishment, the mission has operated under subsequent six-month mandates. The mission’s objectives include reducing “the threat posed by Al‑Shabaab and other armed groups… and to support Somali security forces during the ongoing political process” (United Nations Security Council, 30 July 2018). As demonstrated below, AMISOM’s activity has declined in recent months. 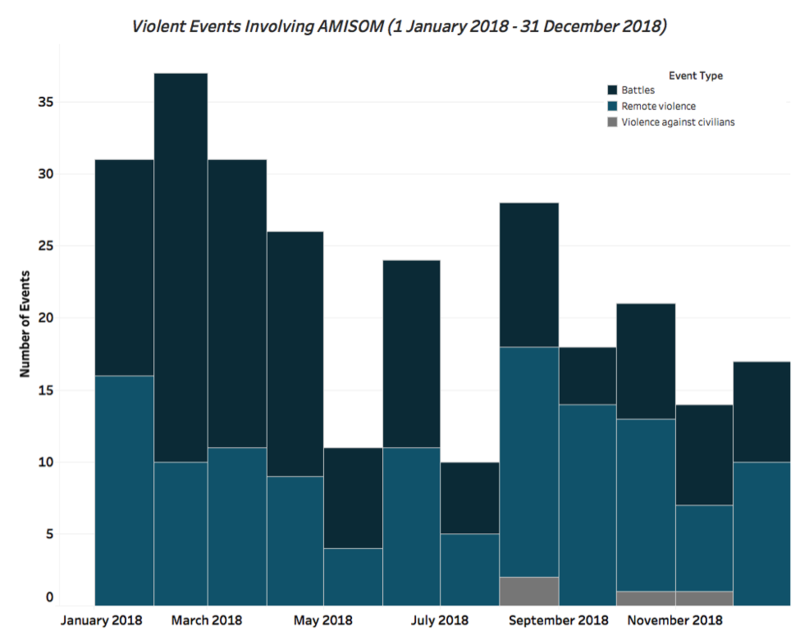 The most active month for AMISOM in 2018 was February, when there were 37 violent events involving the mission; in December 2018, there were just 17 events. At present, the mission’s objective is to hand over control to the Somali National Army (SNA) by December 2021. The mission’s planned draw comes at a particularly delicate time, as popular elections are scheduled to be held in Somalia in 2020-2021 (UNHCR, 13 August 2018). The election and campaign period will provide a number of opportunities for al Shabaab to launch attacks that demonstrate its resilience and destabilise Somalia’s political system, as it has done in the past (Global Observatory, 27 January 2017). 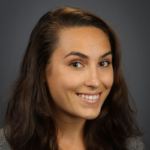 While AMISOM has engaged in both military offensives against armed groups, including al Shabaab, as well as providing support to Somalia’s political system, American military activities in the country have a narrower mandate. Over time, as demonstrated below, violent events involving the United States’ Military have remained relatively frequent, and towards more incidences of remote violence. 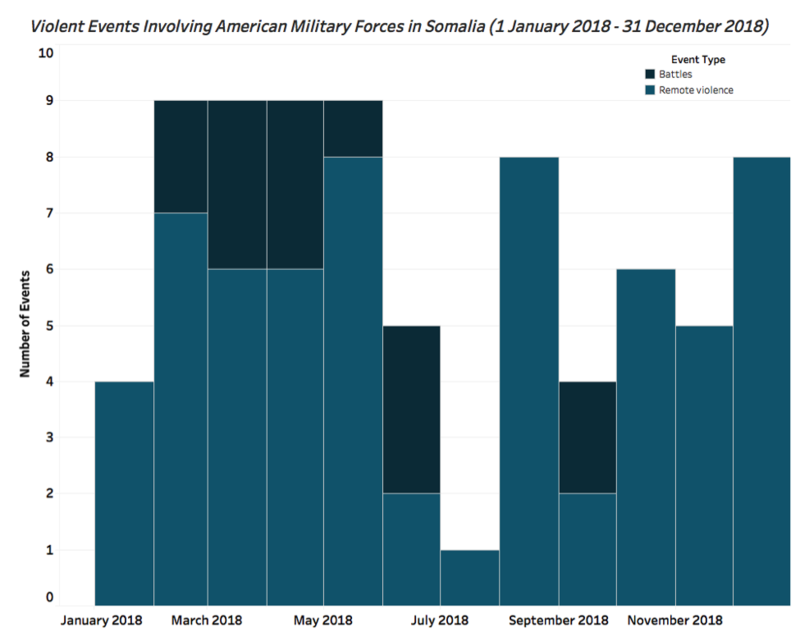 In 2018 there were 77 violent events involving the US military in Somalia. In 2019 thus far there have been 4 instances of violent activity involving the US military – all of which are remote violence events. Ultimately, it is unlikely that American airpower will be able to eradicate al Shabaab’s ability to engage in lethal violence. According the The Long War Journal, despite American airstrikes al Shabaab still “controls large rural areas in southern and central Somalia, and continues to threaten Somali cities and towns” (Long War Journal, 8 January 2019). Leaving aside debates about the strategic and tactical effectiveness of drone strikes, airstrikes in Somalia will likely incentivize al Shabaab to use border towns in Kenya as rear-bases. Though AMISOM intends to hand control over to the Somali government by December 2021 and has begun to ramp down its activity, al Shabaab remains a potent threat in Somalia and Kenya. The group has demonstrated throughout 2018 and into 2019 that it is capable of launching sophisticated and deadly attacks, even as the number of violent activities that it engages in declines. American airpower against the group has been an increasingly relevant feature of the fight against al Shabaab, but it is an insufficient substitute for AMISOM. Though many in the international community seem eager to end the fight against al Shabaab, the group remains a threat to communities in Kenya and Somalia.